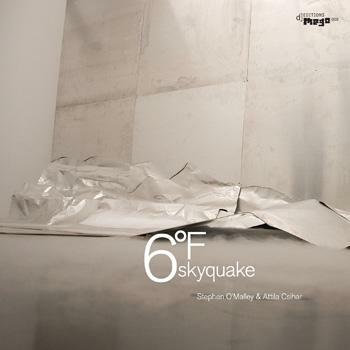 6°Fskyquake is an audio composition designed in 2001 but explored conjunction with the american sculptor Banks Violette's solo shows in summer 2007. Actually, two shows at two different galleries, Barbara Gladstone & Team, running simultaneously for the duration. The interaction of sound and Violette's work revisited concepts touched in prior collaboration of loss, absence, residual energy of a missed evocative experience. The composition was captured at a recording session during the installation process in Team gallery, and later transfered to Gladstone as recorded playback in the public. Designed for 3 separate systems consisting of powered 18" subwoofers and PA tops, the composition runs a total of 8 hours and 35 minutes. This room recording represents a possible stereo interpretation of a portion of that work. The fifth collaboration between Stephen O'Malley & Banks Violette circulated amongst the main theme of sound as physical presence. Sound pressure in substantial space, relative dimension between concrete & perceptual mass, gravity induced by heightened sonic action and standing sub bass pressure. The contribution of lyrics, text & vocals by Attila Csihar inspired by his journeys inside imperial Tokyo bring emotive & meditative identity to the otherwise purely structural composition. For this we shall be blessed. The ghost of presence subsists across physical space, the phantom of absence across linear finite, the shadow of mass via memories. What once was.